PSD Kennels and Training Academy strives to provide top quality personal protection dogs to protect you and your entire family. These dogs, while obedient guardians, are also social and family oriented. All of our personal protection dogs are completely trained in on as well as off leash obedience for total control. In addition to obedience training, these dogs are trained and socialized to live comfortably in your home. We offer affordable personal protection dogs trained at various levels for your home or business. Included with any protection dog purchase is a course designed to get your dog comfortable with his new home. Delivery is available worldwide. We come to your home or place of business and work with you to ensure that you are comfortable working and living with your new protection dog. Our Personal Protection Dogs are fully checked by a Veterinarian to ensure that they are in the best possible health prior to delivery. Clients are welcomed to have these dogs checked by their own veterinarian prior to purchase. X-rays of the dogs’ hips, elbows and spine are also included with the purchase of any personal protection dog. * Defend Handler from vehicle. * Perform a security check for persons in office or residence. * Ability to direct K-9 to alternate attacker. * Higher level of the above listed titles. 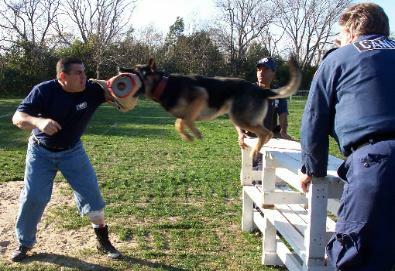 your visit, we will show you dogs that we have available and will demonstrate our training methods for you. Follow-up training at our facility is included in all of our personal protection dog packages at no additional cost. Training can be done at your home for an additional fee. This follow-up training ensures that your dog remains proficient in his abilities to deter threats and prevent attacks on your family.